propagation a powerful step in the process of growing plants. On my farming journey, the questions of "how to begin" has always been important to me, how do I start a farm from a piece of land? What's my first step? When do seeds need to be sown? How do I know what conditions are best and how to properly grow seedlings? Well since this farm was established 40 years ago, I wasn't going to be able to see how to start a farm and since I came in August, I wasn't even going to to see how to start the season, nevertheless, there is the opportunity to at least learn how to grow a crop from seed to transplant. After expressing a desire to be involved in the propagation process, I've been given the opportunity on a regular basis. Seeds are truly incredible, well thought out, well "manufactured" pods. Deep inside each seed the parent plant has packed a nice lunch with just enough nutrients for the root, stem and seed leaves (or cotyledons) to survive until the roots establish themselves in their new substrate, just add water and you are good to go for this first stage of plant life. This seed phenomenon allows for the initial use of a simple potting mix made from vermiculate, which aerates and allows for drainage, and sphagnum moss, which has some nutrients, but mainly holds moisture. We don't need true soil just yet. This combination is the perfect light mix for a plant to begin its ascent. Using this small soil block device, we don't need to buy or use any plastic trays. Instead, we mix the sphagnum moss and vermiculite with a lot of water until it becomes fudge-like as Eliot describes it. This is an integral part to this procedure because if it's not wet enough, the soil blocks won't hold together, same if it is too wet. This is the part that probably takes the most practice to get right. Once you get in a rhythm the blocks come out evenly and it's extremely gratifying. In order to get the soil inside all of the soil block holes, we twist and turn the device until it's each hole is completely filled. It's then placed onto a palette designed for exactly six small sections of blocks. We use extra greenhouse polycarbonate panels we have lying around which are easy to clean and reuse and are also a good material for retaining heat, which is valuable for germinating seedlings which we like to keep on a thermostat around 70-85 degrees F for most seeds. 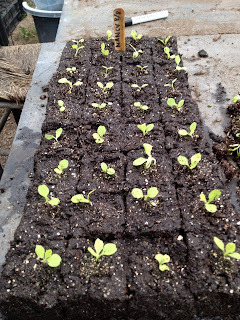 I am working on our fall lettuce and endive plantings with a 99% rate of germination, so I only need to lightly press one seed onto each small 1'' x 1'' soil block. The palettes are placed side by side on the heating pad and left there for several days until they all germinate and are ready to be "potted up" into bigger soil blocks. Using a larger mix of a store bought potting mix, which has a much higher nutrient content through the inclusion of compost, I add water until I get that same fudge-like consistency. 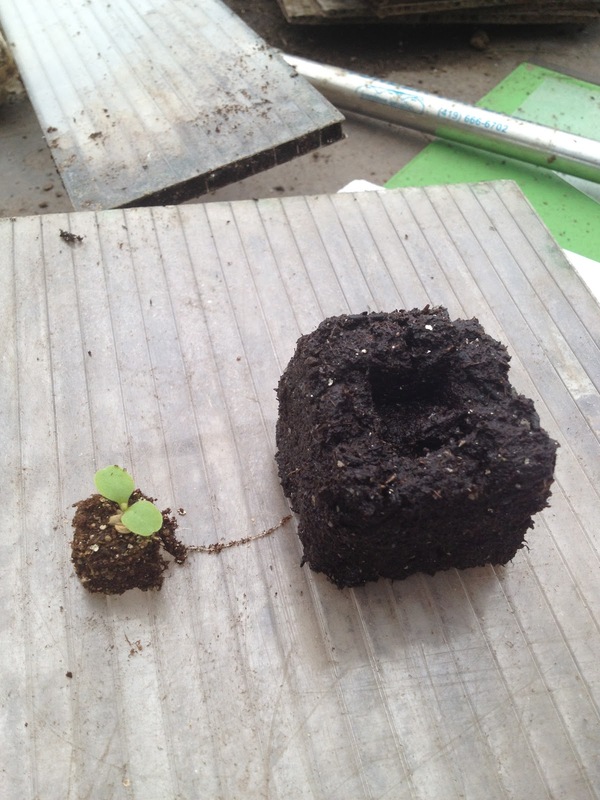 Using a bigger soil block tool I make bigger blocks that are indented with a hole to fit the smaller 1" x 1" blocks that now have germinated seedlings in them. Press gently to ensure the soil and roots are touching their new home. Finally, after about 3 weeks, these lettuce are ready to be transplanted out into the field for fall lettuce production. A gratifying experience to follow a seedling all the way from the seed packet out into the field and then enjoy it weeks later.